The Federal Reserve’s decision this week to hold short-term interest rates where they are and to reiterate its uncertainty about the pace of rate hikes in the future came as a “shock” to some. The Wall Street Journal called the Fed’s inaction a “sharp reversal” from a few weeks ago when even Fed Chair Janet Yellen hinted strongly that rates would likely rise in June or July. The media and the markets have been parsing Yellen’s words from the post-Fed meeting press conference when she declined to “specify a timetable” about when rates will be raised next. “We are quite uncertain about where rates are heading in the longer term,” Yellen reportedly said. So while some might be flummoxed by the Fed hitting the brakes on raising rates, it’s good to step back and realize that we haven’t gone anywhere. We’re right back to a familiar Square One: ultra-low interest rates, slow growth (but growth nonetheless), and a low-return environment. This is hardly an exciting economic picture, but growth is still growth, and when compared to the rest of the world—especially Japan and Europe—the U.S. remains the bright spot. 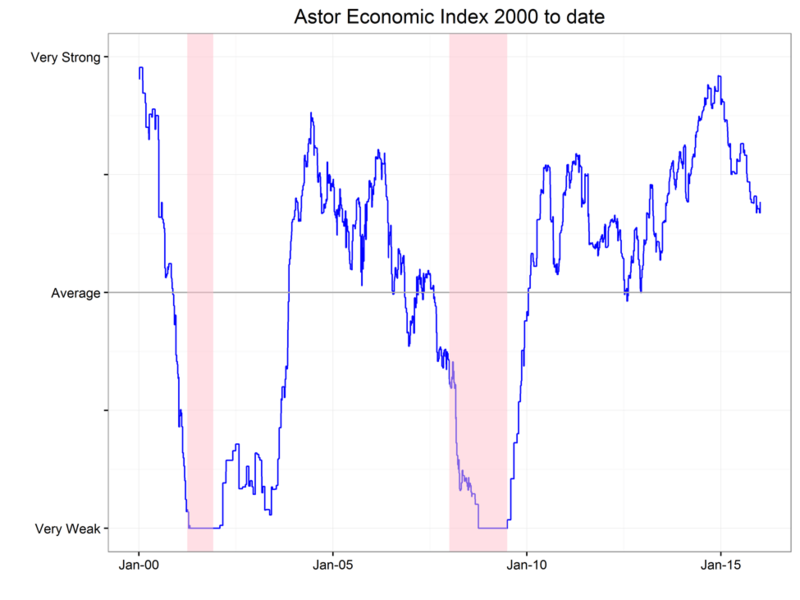 The Astor Economic Index®, a compilation of non-correlated economic data, shows U.S. economic growth is still above average (although modestly so). Government and other forecasts are for GDP to grow by about 2% per year, while inflation remains modest, and unemployment stays below 5%. Even the disappointing Employment Situation report for May, which showed only 38,000 jobs added, could very well be revised upward in June or July. It might not take much for the clouds to part for the Fed to see its way clear, from uncertainty to the long-expected 25 basis point move (which will only be the second, after December’s 25 basis point hike in almost 10 years). Even a better employment picture could prompt the Fed to move from inaction to action. When that might happen is anyone’s guess, and we’re not going to lose sleep over trying to pinpoint when. For many months, we’ve been saying that people are overly concerned about rising interest rates. Whether rates remain here or go up 25 basis points between now and Labor Day just doesn’t make that much of a difference. To use a weather analogy (admittedly an unseasonable one for the start of summer), if it’s -10 degrees Fahrenheit outside and then “warms up” by 5 degrees to -5 or even 10 degrees to 0, it’s hardly a heat wave. You’ll still feel just as cold. By the same token, whether rates stay here or go up 25 basis points, they are still unusually low. So while the Fed retreats to Square One, we should all keep doing what we do best. At Astor, that means continuing our vigilant study of economic data to determine whether there is any significant change in the picture that warrants a different view. For now, we see modest growth, low returns for stocks and bonds, and an environment that rewards risk assets overall.